to Windows Forms and ASP.NET applications. The Manco.Chart for .NET 4.4 is the next generation of the popular charting product. It was completely redesigned for the .NET Framework 2.0. Written entirely with C# Manco.Chart for .NET isn’t a .NET interface over a recycled ActiveX component, but 100% .NET control with efficient memory usage. 100% Unicode support. The user interface of the Manco.Chart for .NET is 100% localizable. Control can be used with C#, VB.NET, and Managed C++ as well as other languages which use .NET Framework. All error handling reports carried through .NET exception classes. Different chart types support multiple modes, meaning that literally hundreds of different styles and types are available for developers. 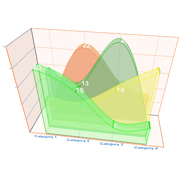 The legend can be flexible integrated to the chart area. The multi-line headers and rotated labels are supported. The chart layout (titles, fonts, colors, labels’ escapement etc) can be defined using rich and powerful API or in the XML document, so you can easily manage the style of your chart by changing the parameters. Manco.Chart for .NET have very flexible data load model that allows using literally any data source for charting. Manco.Chart for .NET allows using data from the XML, array of doubles and DataTable object right 'from the box'. Also you can create your own classes to access data from the other data sources (Web services, for example) without converting it to the XML or array of doubles. For yours and your users convenience library provides the Chart Layout control that allows you change all parts of the chart’s layout by using a single easy form. Click on a chart type to view the screenshot! Copyright © 2008 Manco Software. 1. Features of our product are similar or better than our competitors. 2. Price starts at just $39.00 which makes this product #1 on the market correlating Price - productivity. 3. You get excellent support with this product which can sometimes cost you more than the product.